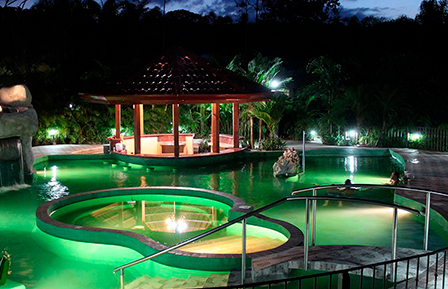 The tour begins with a pick up from your Arenal area hotel. Drivers will drop you off outside of town, where you’ll meet guides. You’ll head out along forested trails towards the waterfalls. Upon arrival, trained specialists will fit you with equipment and show you the proper way to rappel down the falls. You’ll then descend five waterfalls within a stunning canyon; four are alongside or directly in the falls, while one is along a dry rock face. After completing this adventure, you’ll trek out of the canyon and you’ll ride to the Balsa River. Here you will meet your guides, who will explain the proper safety procedures and provide you with rafting equipment. Once ready, you’ll launch into the water and embark upon a wild 2-hour ride down the Balsa River. After surging through the rapids known as “Magnetic Rock” and “Dredges,” you’ll reach the San Carlos Bridge, which marks the end of the journey. Here you can swim, sip cold drinks, and snack on tropical fruit. A hearty Costa Rican lunch will follow, after which you will be transported back to your hotel. This tour departs daily at 7:30 AM and returns at 4:00 PM. What to bring: Fast drying clothes, swimsuit, adventure sandals or light hiking boots, camera or video (dry bags are provided), change of clothes, towel, and sunscreen. Tour includes: Transportation to and from most La Fortuna hotels, bilingual certified guides, fruit, snacks, cold drinks, lunch and towels. There is an extra fee for transportation to/from hotels in the El Castillo and Lake Arenal area. We trek through the forest on a magical trail that leads to some of the most spectacular waterfalls in Costa Rica, a place that few people get to experience. Along the way we will have the chance to discover the secrets that lie hidden deep within the canyon.